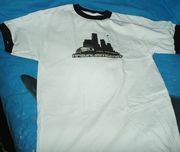 A special contest was organized on NFSUnlimited.net in August 2006 with the aim to find a suitable design for NFSUnlimited.net's tshirts. From the large number of entries 4 were chosen as the finalists and all are available in the tshirt store for sale in various shapes and sizes. 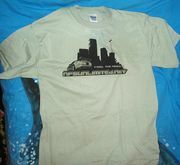 The contest to pick designs for the official NFSUnlimited.net tshirt began in the forum on August 2nd 2006 with simple requirements and a little less than a month available to enter. Nearly a hundred different entries were submitted by different users, including old time veterans and newcomers. When the deadline was over, the staff picked 5 finalists and left the final selection to forum users. Toineed's Feel the Speed design won with 40% votes received, 2nd place and 15% of votes was shared by Sir Ibi and chad2006, Boganbusman came 4th again with 15% and H.Pierrot last with 12% of votes. From the 5 semi finalists, 4 designs, including Sir Ibi's, boganbusman's, chad2006's and Toineed's, are available for purchase on various products. Various products are available for purchase by a Denver, USA based printing service Printfection.com where NFSUnlimited.net has a dedicated shop.